Bernard Madoff has left MCC Manhattan for Butner, N.C. where he will spend the rest of his life. Butner has medium security and low security facilities as well as a camp and medical facility. Adelphia Communications founder John Rigas, 84 and his son Timothy are both at the low security facility there. Jonathan Pollard, serving a sentence for spying, is at the medium security prison. And blind sheik Omar Ahmad Rahmad, now 71, is serving his life sentence at the Butner medical facility. His lawyers had asked for him to be sent to Otisville in NY. Bottom line: Madoff could have done much worse. Bernie Madoff's lawyer has confirmed that Bernie won't appeal his 150 year sentence. He thinks any sentence Bernie would get, even under the guidelines, would be a life sentence. Can someone remind me what Bernie Madoff's lawyers' accomplished for him? He could have stayed with his wife in his apartment on bond for another year or two while fighting the case. He got no agreement that his family and friends wouldn't be investigated or charged. He and his wife gave up all his assets (except $2.5 million his wife gets to keep), including those that would have been difficult for the Government to prove were forfeitable, he got no sentence concession, no agreement on place of incarceration. And now they won't appeal the sentence. The U.S. Marshal's today "seized" Bernie and Ruth Madoff's Park Ave. apartment, which they agreed to forfeit to the Government. The Marshal's served Ruth with a "Notice to Vacate." This was by agreement (pdf) which provided that Ruth would vacate by Bernie's sentencing date or such other time as the parties agreed to in writing. Only once she's vacated the apartment, does she get her $2.5 million cash from the Government. So, she's not being tossed unexpectedly onto the street. Bump and Update: Bernie Madoff has been sentenced to 150 years in prison. The probation report had recommended 50 years. He is likely to do his time in a medium security prison. Possibilities, according to prison expert Alan Ellis: "FCI Otisville or FCI Ray Brook, both in upstate New York, FCI Fairton in New Jersey or FCI McKean in Pennsylvania." 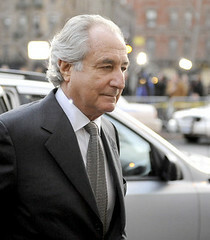 Bernard Madoff will be sentenced today. The government is seeking 150 years. The defense is seeking 12 years, arguing that considering his age, it's an effective life sentence. Ruth Madoff has agreed to forfeit around $80 million (including the Park Ave coop, the Montauk home and the Palm Beach home) in exchange for $2.5 million. Bernie Madoff's accountant David Friehling surrendered today to face charges of securities fraud and other offenses in a criminal complaint (pdf). Friehling served as Madoff's auditor. In a statement, the SEC said Friehling "merely pretended to conduct minimal audit procedures of certain accounts to make it seem like he was conducting an audit." Accurate financial statements would have shown that Madoff's securities firm "owed tens of billions of dollars in additional liabilities to its customers and was therefore insolvent," the SEC said. The I.R.S. announced today that victims of Bernie Madoff's ponzi scheme will be entitled to tax refunds if they paid taxes on phantom profits. Madoff investors should have been reporting earnings from their investments with him through the years and thus paid taxes on those earnings. Given that some of those were "phantom" profits, investors have said they should be entitled to refunds of the taxes they paid. ....By some estimates, the IRS could be out as much as $17 billion in lost tax revenue from refunds to investors who earned fictitious profits in the Madoff scheme. Where Will Madoff Serve His Sentence? There's wild speculation all over TV and the internet about where Bernard Madoff will serve his ultimate sentence. A hyper-ventilating legal pundit on Fox News was yelling he'd go to a maximum security facility. Not so fast. Update: 11:16 am: Sentencing will be June 16. The Government asked for immediate jailing. CNBC and CNN report the Judge said he intends to grant the request and order Madoff into custody immediately. It's done. Update 10:55 am: The Judge has accepted the guilty plea. The Government is telling the judge how the scheme operated. The victims who object to the plea are now being heard. Next issue should be bail. Does anyone find it unusual that Bernard Madoff's lawyers didn't file a motion today for bail pending sentencing? I just checked the court docket and the only thing they filed were their entries of appearance. The only filing by the Government was the emails it received from victims, which it filed under seal. There is no Sixth Amendment exception for accused criminals who are particularly out of favor with the public. Bernard Madoff is entitled to a lawyer, just like everyone else who is charged with a crime. Why, then, do some idiots feel the need to threaten Madoff's lawyer, Ira "Ike" Sorkin? The man is just doing his job (and as Jeralyn pointed out, he's done it by pleading Madoff straight up to all the charges against him -- hardly a strategy that should enrage the public). Memo to the crazed loons who are threatening Sorkin: You're likely to need your own lawyer one day. You might want to rethink your animosity to those who spend their lives defending the accused. Where's the Bone for Bernie Madoff? Yesterday I wrote about the details of the Bernard Madoff non-plea agreement in which he pleads straight up to all 11 counts against him and receives no sentencing concession, no promises about non-prosecution of family members and no agreement that the Government's continuing investigation won't affect his wife and other family members' assets. He's 70 years old. Even if he gets a 25 year sentence with good time, he's likely to die in prison. He's not going to a minimum security camp. So why is he pleading guilty? Are there secret agreements we don't know about? It's customary in a death case for lawyers agree to a deal where the client gets life. For some, life without parole is preferable to death. I may not agree, but I can understand it. But this? He's pleading guilty to a sentence of up to 150 years. The Government says it's no longer bound by its earlier promise at the time of the bond hearing not to take $70 plus million assets in the name of his wife. The Wall St. Journal now reports that prosecutors say the investigation is continuing and her ability to keep her assets depends on what they find. Details of Bernard Madoff's expected guilty plea emerged today when he appeared in court for a hearing to waive any conflict of interest his lawyer might have from past representation of other clients. Madoff will plead straight-up -- no plea agreement-- to 11 charges in the Criminal Information. “There is no plea agreement,” Assistant U.S. Attorney Marc Litt said at the hearing, meaning Madoff must plead guilty to 11 counts that he now faces in a criminal information filed today. Madoff is charged with securities fraud, investment adviser fraud, mail fraud, wire fraud, three counts of money laundering, false statements, perjury, false filings with the U.S. Securities and Exchange Commission and theft from an employee benefit plan, Litt said. Friday it was reported that Bernard Madoff had reached a plea deal with Government. He is expected to enter a guilty plea Thursday to whatever charges were agreed upon on. Today, the Government asked the Court to notify potential victims of their right to seek to be heard at the plea hearing. So far, 78 e-mail responses were received, 25 indicating a wish to be heard. The Government filed a pleading (pdf)in Bernie Madoff's case today stating he would waive Indictment and it would file an Information. Translation: Plea deal has been reached. More here. Generally, a court must release a defendant on bail on the least restrictive condition or combination of conditions that will reasonably assure the defendant’s appearance when required and the safety of the community. See 18 U.S.C. § 3142[c](1)(B). The issue at this stage of the criminal proceedings is not whether Madoff has been charged in perhaps the largest Ponzi scheme ever, nor whether Madoff’s alleged actions should result in his widespread disapprobation by the public, nor even what is appropriate punishment after conviction. The legal issue before the Court is whether the Government has carried its burden of demonstrating that no condition or combination of conditions can be set that will reasonably assure Madoff’s appearance and protect the community from danger. 18 U.S.C. § 3142(e).